Despite their affordability and family-friendly nature, farmers markets are a surprisingly underrated summertime activity in Brunswick and surrounding cities. Not only do these adorable markets offer delicious, farm-fresh produce and baked goods, they often provide other fun attractions like food trucks and live music from North Ohio’s many bands. By shopping for your groceries at these weekend events, you’re also supporting local businesses who work tirelessly to give back to the community. To help you find the best farmers markets around, we’ve compiled a list of our favorites for your enjoyment. Founded in 2013, Brunswick Farmer’s Market has quickly become a community staple in Brunswick and continues to attract a growing roster of vendors. Held on Heritage Farm, the home of the Brunswick Area Historical Society, this seasonal market opens on June 15 and runs every Sunday during the summer and early fall from 11 AM to 2 PM. While enjoying the live musical acts, visitors are welcome to shop for fresh produce, eggs, meats, and baked goods, and then order a delicious lunch from an on-site food truck. Brunswick Farmer’s Market ends the season with their famous Pumpkin Festival, spanning the weekend of October 10 to 11. Learn more at brunswickhistory.com. 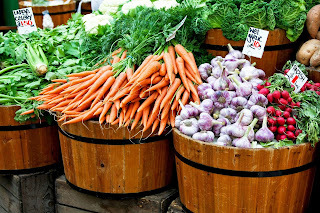 Open every Saturday morning at the charming Valley City Depot, this farmers market is known for its colorful array of veggies, fruits, and fresh herbs, all gathered by local growers. Other best-selling items include maple syrup, flower bouquets, and baked goods like breads and sweet treats. Valley City Farmers Market starts the 2018 season on June 1 and runs until October. Their visiting hours are 9 AM to 12 PM. Visit their Facebook page for additional information. Friendly vendors, locally-grown fruits and vegetables, scrumptious breads, scones, pies, cookies, cupcakes, kettle corn and donuts, organic meat, hand-crafted cheeses and fresh pasta, brilliant flowers, plants and herbs, jams, jellies, maple syrup, peanut butter, trail mix and honey, sweetly-scented locally-made soaps, beautiful handmade purses, scarves, and jewelry, top-notch entertainment and a festival-like atmosphere all make the Medina Farmers Market a great place to spend a Saturday with family and friends. As the seasons change, so do the market offerings; there’s always something new and exciting in store for our visitors.